I was introduced to Sean and Jem’s story when J.A. Belfield’s debut novel Darkness & Light first came out. I have to say I loved it, a novel I’m sure I’ll enjoy reading again in a few years. In the first novel we meet a Jem and Sean from the present, though their great love affair began over a century earlier—their souls permanently connected through a spell. I have to admit, though I loved Darkness & Light, it left me curious about the first couple, the original Jem and Sean. If you haven’t yet read it, I suggest you pick up a copy of the novella Instinct before you read Eternal so you’ll know how Jem and Sean first meet. Eternal begins after Jem and Sean have already been together for three years. Though Eternal is a novella and doesn’t have the detail and depth involved one would expect in a full length novel, I enjoyed how we dropped straight into the story. I thought the author did a great job to bring across not only the setting of the early nineteenth century, but the actions of the characters living there. Sean must be ruthless in his dealings with outsiders if he wants to keep Jem out of the hands of rival packs. And there are many who want her, because Jem is the only female werewolf known to exist, the first woman to survive being bitten and turned. Other werewolves are naturally curious about her and will take her from Sean if they can. Tension levels are kept high as we see a new powerful male invade their area. Maybe this one will be strong enough to do what all the others have failed at so far—take Jem away from Sean before he can marry her. But Sean’s greatest fear doesn’t come from fighting off rivals for Jem’s affection, but more from the need to approach Jem’s mother and ask for permission to marry her daughter. 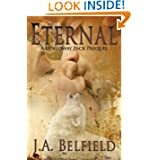 Powerful werewolf meets protective human mother—I’ll leave it to your imagination, or you can pick up your own copy of Eternal and read it for yourself. A fun romance, fast read, and highly entertaining. Posted by Denna Holm on July 1, 2012 in Archives and tagged lovers, novella, paranormal, prequel, Romance, shifters, werewolves.